Fash Boulevard: 31 Bits Holiday Collection! I'm so excited to share the 31 Bits Holiday Collection with you guys. You may remember me raving about this amazing company here and here but their latest collection is better than ever. This sparkly and radiant collection is a must when it comes to adding a dash of glitz to your fall/winter wardrobe. For those of you who aren't familiar with 31 Bits, each piece is handmade by women in Uganda, providing these talented ladies with jobs and education to move beyond poverty. 31 Bits urges you to "look glamorous and give glamorously" with 31 Bits Holiday Collection. Shop the pieces here! Thanks for your comment. I love what you're wearing...head to toe. Your skirt is so pretty! Amazig outfit. Love your skirt and that pretty pattern blazer. Those nails! Your boots! You look fabulous!! I like the combination of colors here! I am loving this location that you are taking your pictures at. Beautiful place you live. Love how you styled this great blazer. I need to something plaid for this season. Obsessed with this look, Anna. Gorg. Oh my gosh, I love the blazer! Even better that it's from Target... I love all of it! You're so beautiful! I love your skirt. Love this outfit. The skirt is cute and those boots are fabulous. This is one of my fav looks!!! I want to go home and paint my nails sparkly now. I am such a sucker for plaid and I love the mix of navy red and green here! Perfection my dear! Such a fabulous piece! I adore the color and it does make a great statement piece to a wardrobe/look. You are looking gorgeous with the plaid blazer and boots. You look stunning. The color combo is fab. LOVE LOVE LOVE tthat blazer. Such a beautiful look all around, that necklace is amazing! Ana you look gorgeous and I love that skirt. I love this entire look. Very inspirational. Thank you so much Anna for stopping by my blog and your sweet words! Love this look, that skirt is adorable!!! So chic! Stay in touch! This company sounds awesome, & I love what they do for the women in Uganda. Their clothes are also super chic, I love this look!! Such a great look! I love the shape of the skirt and the fit of the blazer. That necklace is unique and so gorgeous! what a beautiful necklace! it's perfect with your outfit! Follow me and i will follow you too!!!!! Love that necklace on you but that blazer is Target?! 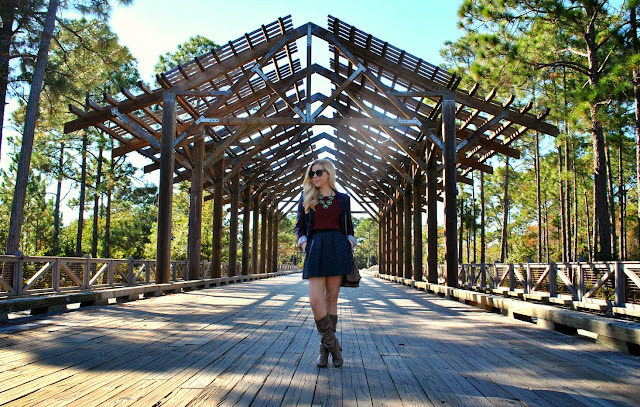 How cute and perfect for fall! That blazer and necklace are my new must haves. Very cute. Anna, I love how much joy and color a tartan blazer can bring to this look. love it! You look adorable! I like this pretty outfit! That blazer is absolutely stunning! Perfect jacket beauty ! I love your boots too. I love 31 Bits! Don't have anything from them (yet) but I love this necklace! And the whole look for that matter. Thanks for stopping by my blog, lady! I think this is my favorite outfit you've ever worn. Beautiful. You look so cute in this outfit. Love that blazer! You are a very sweet girl! Nice casual outfit! I love your skirt, so cute!! Such a cute outfit! That blazer is amazing - love the colors! Great photos! I love the skirt. I want this whole look. So pretty! Love the necklace! Anna, you look gorgeous. I love the scenery and how beautifully it goes with the outfit. That necklace is perfect! I love your skirt! Gorgeous!! Love love this look, so cute. i was going to say, did you get the blazer at target? but indeed you did! haha i saw that one there! loving this look. the burgundy and navy are great together! This is absolutely gorgeous!! I love how you styled this and that blazer is beyond pretty! Beautiful! I love the plaid jacket and sparkly nails! Those boots are so cute and I love your necklace! Love the blazer! So on-trend! That jacket!! Love that it's from Target. thank you for sharing such a wonderful org. 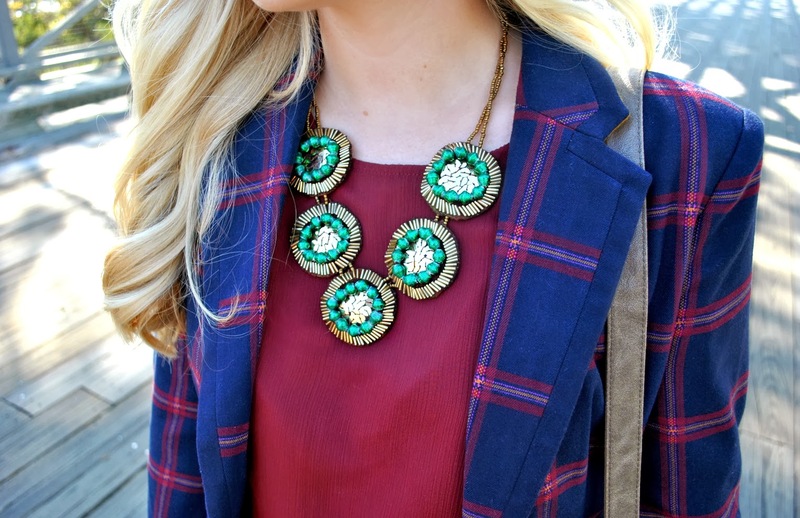 Love the way you incorporated plaid with a blazer! So preppy! love love your blazer and sparkly nails! Love this blazer! I've been doubting if I should get a plaid top or maybe a skirt.... You look great! Lovely! I've really enjoyed seeing the 31 Bits images from you & Julia Engel over at Gal Meets Glam. Does anyone know what brand the nail polish is? Hi Anna! I LOVE following your blog! So glad to see a fellow AU alum doing such amazing work with our AMPD degree :) I'm OBSESSED with Olivia + Joy, LOVE the give away! Such a cute look and I love the concept behind the company too! Beautiful outfit! And the necklace is the perfect completer piece! Such a cool and sweet necklace.